Like Mesopotamia and Egypt, the first civilizations in India and China developed in the basins of great rivers. The first civilization of which we have so far found evidence on the Indian subcon­tinent developed in the Indus River valley of present-day Pakistan. In China the first signs of civilization are found in the Huang He and Yangtze River Valleys. While the first Indian civilization developed into a complex urban culture early on, the first Chinese cultures did not develop cities until much later. Uncovering information about life in early India and China has been more difficult than learning about ancient Mesopotamia or Egypt. The Indus River ValleyThe Indus Valley is a broad plain hemmed in by desert to the east and mountains to the west. Geographically, it is much like the valleys of the Nile, the Tigris and the Euphrates. The flooding of the river provides both the water essential for agriculture and enriching silt that replenishes the soil. With its source in the Himalayas, the Indus River floods when the mountain snows melt in the spring. It also floods when the monsoons, seasonal rain-bearing winds, bring heavy rains to the western Himalayas. Otherwise, the surrounding land is relatively dry and may be easily cleared for settlement and agriculture, even without the use of iron tools. Given such ideal conditions, it is perhaps little wonder that by about 3000 B.C. people lived along the Indus River in small, widely scattered villages of mud-brick houses. Although these people mainly used stone tools, they were also beginning to use metals such as copper. 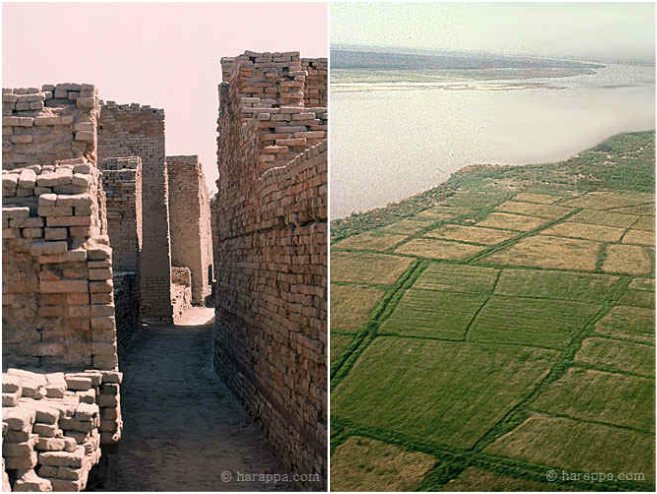 As in Sumer and Egypt, the production of surplus food by means of irrigation agriculture seems to have led to the development of cities in the Indus River Valley. By about 2500 B.C. a full-fledged civilization had emerged. Harappan Civilization. The two most important cities in the Indus Valley civilization were Mohenjo-Daro on the lower Indus, and Harappa, 400 miles to the northeast. Harappa has provided archaeologists and historians with so much evidence of early Indus Valley life that they have named the civilization in this area Harappan civilization. From about 2300 to 1750 B.C. Harappan civi­lization expanded over an area larger than all of Sumer. Despite its enormous expanse, the civilization was remarkably uniform. Weights and linear measures were the same throughout the region, as were the types of copper and bronze tools people used. Many scholars believe that such uniformity of cultural elements also points to some sort of political unity in the region. Whether the entire region was unified politically or not, the cities of Harappa and Mohenjo-Daro at least were extraordinarily well planned according to highly sophisticated designs. Each city had a population of about 35,000 - all of whom lived in an area roughly a mile square. Each city had a strong central fortress, or citadel, to the west, while to the east lay the houses and public buildings. Each city was also laid out on a grid pattern, so that streets intersected at right angles. The buildings of Harappa and Mohenjo-Daro were designed for practical use. Many were constructed with durable burnt bricks that had been baked in kilns, or ovens – a process that made them far stronger than the sun-dried bricks commonly used in Mesopotamia. Houses faced inward on open inte­rior courtyards apparently to ensure privacy, but also perhaps for security. The walls along the main streets were solid brick, broken only by openings for drainage chutes. Almost every house had its own bathroom, with brick floors and covered drains that carried wastewater to the main street drains of the city's water­ removal system. Some homes had their own wells, while others used public water sources. The engineering skill demonstrated by the Harappans in these water and drainage systems would not be matched again until the time of the Roman Empire, over two thousand years later. Although Harappan civilization was apparently urbanized and sophisticated, farming remained essential to the survival of city residents. The most important crop was wheat, but farmers also grew barley, peas, dates, and mustard seeds. The Harappans also kept a wide variety of animals, including cattle, pigs, goats, and sheep. City-dwellers worked primarily in industry or trade. Indus Valley artisans produced fine articles, including excellent cotton cloth, painted pottery, artistic bronze sculpture, copper and bronze weapons and tools, and gold and silver jewelry. As early as 2500 B.C. they appear to have been trading these goods with Mesopotamian merchants. Although for many years scholars assumed that the people of the Harappan civilization had developed a writing system comparable to those of Egypt and Mesopotamia, recent research has challenged this view. Archaeologists have found what appear to be pictographs, usually in the form of cylinder seals, dating from about 2300 B.C. Additional symbols have been found on clay pots and pottery fragments. Unfortunately, no one so far has been able to decipher any of the symbols or to demonstrate definitively their connection with any particular language. Nor do all scholars agree that the symbols actually represent the written form of an spoken language. They may simply be symbols universally recognized throughout the Harappan culture zone - rather like the symbols found on modern traffic signs or in airports, hospitals and other public buildings. Perhaps they represented gods and goddesses, or natural objects such as the sun, moon or stars, or animal spirits, which people used as charms or magical talismans to ward off evil or to invoke blessings and luck. It has also been suggested that the seals were used in trade either as elementary forms of identification, much like the coats of arms of medieval Europeans, or as rudimentary means of identifying and counting products. So far no inscriptions have been found that are long enough to suggest anything like complex documents or literature. On the other hand, as traditional scholarly views have held, they may be a combination of pictograms and ideograms, pictures that convey whole words or ideas, and representations of syllabic sounds, or a combination of all three, like the hieroglyphs of ancient Egypt. Without further discoveries and research we can only speculate. If Harappan society was preliterate it may help to explain why no Harappan temples, shrines, or religious writings have been found - although scholars believe that the Indus Valley inhabitants worshipped a great god and used certain animal images – the bull, buffalo, and tiger – in religious ceremonies. Some evidence also points to the worship of a mother goddess who apparently symbolized fertility. There is even a hint in some depictions that the Harappans may have practiced human sacrifice. It does seem clear that they had some sort of belief in an afterlife, however, since they generally buried their dead formally, with personal possessions such as pottery or jewels. Some were buried in large brick chambers, but most were buried outstretched on their backs with their heads pointing north. At the city of Lothal, about 400 miles southeast of Mohenjo­Daro, archaeologists have found several double graves, each containing a male and female skeleton. Harappan decline. Despite this rich and thriving culture, the most extensive in the ancient world, the unity of Harappan civilization shattered some­time around 1500 B.C., for reasons that scholars continue to debate. For many years, most researchers believed that invaders had destroyed the civilization. More recently, however, others have suggested dramatic climatic or environmental shifts may have precipitated Harappan decline. Some evidence, for example, points to rapidly occurring changes in the course of the Indus River that might seriously have disrupted agriculture. Other scholars believe that major earthquakes and flooding struck the region about 1700 B.C. The discovery of several unburied skeletons, together with homes and personal belongings hastily abandoned, seems to indicate some disastrous event at Mohenjo-Daro – though whether it was environmental or human in origin - or a combination of both - no one can tell. Perhaps the earlier notions of invasion are not entirely without merit. Without further evidence, however, we can only continue to speculate and to make educated guesses. During the Neolithic era, the first settlements in China were along the Huang He, or Yellow River, which flows through the great plain of northern China. In the valley of the Huang He, nomadic peoples settled in areas between wooded hills and swampy lowlands, where enough plants and animals existed to keep them alive even when their farming might not be successful. The climate of the Huang He valley. Like other ancient civilizations, Chinese civilization originated in regions with fertile soil and plentiful water supplies. Over many centuries the prevailing winds of North China had deposited a fine yellow dust along the North China Plain. This dust formed into a very rich soil called loess (LEs), which in some places formed a layer 350 feet thick. This fine yellow dust was also carried along in great quantities by the Huang He, which got its name from the yellow silt created by the dust. Much of the silt was deposited on the riverbed, which made the Huang He too shallow for navi­gation, though still useful for irrigation, and cre­ated new lowland. Every few years, particularly after heavy rains, the Huang He would overflow its banks in destructive floods. Raging floodwaters often destroyed everything in their path, turning once usable farmland into waterlogged swamps. Such destructive floods led the ancient Chinese to nickname the Huang He"China's Sorrow." The general climate in the valley of the Huang He was also severe. Winters were long and cold, summers short and hot. Dust storms swept across the valley in the spring. Rainfall too was unpredictable and heavy rains alternated with periods of drought and famine. Yangshao Culture. The earliest Neolithic culture so far discovered in China is called the Yangshao, after the village in Henan province, in northern China, where its artifacts were first found. Between about 5000 and 3000 B.C., Yangshao culture spread over a fairly wide area around the middle of the Huang He and one of its major tributaries, the Wei River. 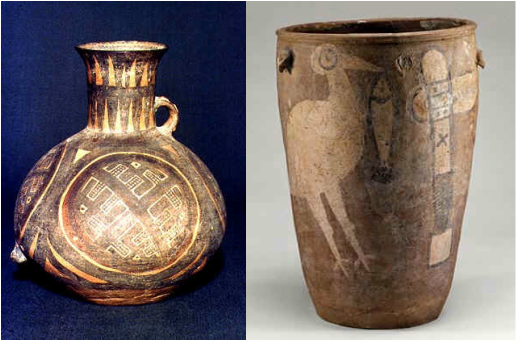 Archeologists recognize Yangshao culture largely by its characteristic painted pottery. Apparently unfamiliar with the potter's wheel, Yangshao artisans formed their pottery by hand, then decorated it with pictures of fish, animals, plants and geometric forms. Extent of Yangshao culture, http://en.wikipedia.org/wiki/Yangshao_culture. Although people in the Yangshao culture were farmers, they also hunted and fished. They relied solely on human labor in their farming techniques, tilling the soil by hand with hoes since they did not yet have the plow. Millet seems to have been the most important grain crop, although some villages also grew wheat and even rice. They also domesticated a number of animals, particularly the dog and the pig, and later apparently ; they also raised pigs and sheep. In addition, farmers grew hemp, which they made into cloth, and there is even some evidence that Yangshao farmers may have raised silkworms. The people of the Yangshao culture built their houses in clusters. Some archaeologists have argued that this suggests a clan structure in which people lived in groups of related families. If this interpretation proves correct, it would be the earliest example of the strong, clan-based type of society that is a feature of later Chinese civilization. At any rate, as Yangshou culture spread it provided a foundation on which a more sophisticated culture would soon build. Longshan Culture. Known as Longshan, from the first site discovered by archaeologists in the 1930s, this second Neolithic culture became more complex and widespread than Yangshao. From about 3000 or 2600 (scholars debate the dating) to 2000 B.C. Longshan Culture flourished on the North China plain and along the eastern seaboard of Central China. It also spread over all those areas that had been part of the Yangshao cultural zone. Since its discovery, modern scholars have primarily recognized Longshan Culture by its distinctive, highly polished and delicate black pottery. Unlike Yangshao potters, the artisans ofLongshan were the first in east Asia to use a high-speed wheel on which to throw their pots. They also fired them in kilns at very high heat. The Longshan were also farmers, though unlike the Yangshao they appear to have depended more heavily on rice cultivation than millet or wheat. Wet-field rice farming is highly labor intensive and requires enormous coordination to create the dikes and channels with which to get river water to flood the paddies. On the other hand, it is also about eight times more productive than millet or wheat farming. A culture relying on rice can produce greater surpluses and sustain a much larger population than one relying on other grains. Even more important for the development of civilization in China, however, Longshan Culture was apparently the first to begin to build relatively large fortified towns. The Longshan people developed a new technology for construction that involved rammed-earth walls and platforms. As their culture developed, they increasingly used these techniques to build large walls around their settlements. From all the archaeological remains, it seems that Longshan builders also preferred higher ground for their cities, on small hills or knolls, where they could look down over the plains below. Such strategic thinking suggests that the Longshan were concerned with defense against enemies. Extent of Longshan Culture, http://en.wikipedia.org/wiki/Longshan_culture. In addition to building such major fortified cities, the Longshan also began to use bronze artifacts. Jade too became enormously important, at least partly as a symbol of status. While we have no real knowledge of their religious customs, they practiced human as well as animal sacrifice regularly, and when rulers died, wives, concubines and other servants were often buried alive to keep them company in the grave. Many Chinese scholars have become convinced that Longshan Culture is the “mythical” Xia dynasty, which according to ancient Chinese tradition was the first dynastic state in China. The discovery and excavation of a major city from the late Longshan period in 2002-2004 at Wangchenggang near Dengfeng in Henan Province has only reinforced this conviction. There, archaeologists have discovered sacrificial pits with human bones, human skulls used in rituals, long hollow pieces of jade with rectangular sides, and white pottery, which demonstrated the noble status of the owner. At a nearby site, in 1977, archaeologists had already discovered a smaller city containing fragments of bronze wares and building foundation pits containing the skeletons of human sacrifices. They even discovered inscribed characters that may be a form of writing, though it has so far remained undeciphered. In short, although we have no written records to guide us, it seems reasonable to suggest that Longshan Culture was comparable to the city-states of Sumer. At the very least, it is increasingly clear that Longshan Culture was indeed the base on which the first historical dynasty, the Shang, would eventually build.